In the DB-Engines ranking of April 2015, MySQL increased the score by more than 23 points or about 2% compared to the ranking of the previous month. That reduces the gap to Oracle (still the undisputed number one of the ranking) to 162 points and secures the second rank with 135 points ahead of Microsoft SQL Server. 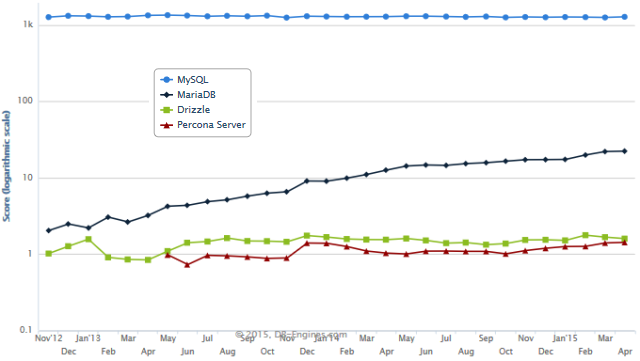 MariaDB is continuously increasing its popularity (currently rank 25), but is still far behind MySQL. It has become the default database in some Linux distributions, but the strong public attention it gained when Wikipedia announced the migration from MySQL to MariaDB seems to have settled. Drizzle, as another MySQL fork, with its modularized, pluggable code base is rather losing ground. Moreover, the fact that the latest stable release of Drizzle is from September 2012 does not really strengthen the confidence in a some way out of a drizzle. Percona Server, which is focused on performance improvements and comes with additional diagnostic and management features not available in the MySQL community edition, is already close to Drizzle. It would be no surprise, finding it overtaking Drizzles popularity in the next months. WebScaleSQL was announced a year ago by Facebook, Google, LinkedIn and Twitter (with Alibaba joining them in January 2015) as a joint effort to implement specific MySQL features and changes for its use at the scale of large web companies. In order to allow the merging of their development with future MySQL versions, it is explicitly designed as a branch and not a fork of MySQL 5.6. The relative youth of WebScaleSQL and the intended limited application scenario, may explain its rather low popularity (only rank 181 of 259 systems listed).